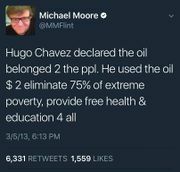 Venezuela (Hugo Chavez) was everything that Hollywood, Michael Moore, Sean Penn and other limousine Socialists wanted: they came in, nationalized the oil, redistributed the wealth (created education and lots of programs)... and eventually the wealth ran out. And Venezuela went from being one of the economic capitals of growth and industry in South America, to a collapsed country with rampant poverty that produces little but crime and refugees. So what did we learn? That's a joke, if Socialists could learn, they would have gone extinct thousands of years ago. What some of us learned is that Socialism can work for a short while, but central planning always underperforms a free market. They may collapse in 5 years, or may struggle for 50, but the idea that the central planners know more than everyone else, is flawed at it's nature. What happens is that they focus on the best producing industries, and run them more efficient by eliminating competition. But while that leanness looks good in the short term, it suffocates innovation, and it destroyed diversity of their economy (everything becomes about the few things the planners are focused on, and everything else starves out). Then when enough innovation happens in their key industry (and the didn't keep up), or a disruptive technology comes along, they all suffocate and have nothing else to fall back on. And the real illiterates will claim, "Real Socialism has never been tried", and invent a reason for why another failure doesn't count. Michael Moore - was a definite fan of the policies. This page was last edited on 2 March 2019, at 17:33.